08:52 A.M. (SET) Breaking news: The meaning of last week's mysterious TSS message has been uncovered! TSS hackers have introduced a new method of taking away credits from others: the credit hack. This release comes in a most perfidious fashion: The credit hack routine was embedded in a special root virus and was uploaded to the central ISDC hub, leading to a universe-wide update of all ship computers. From now on, the credit hack will be applied automatically in all ship to ship raids, giving attackers the potential to steal millions of credits from their victims. 10:21 A.M. (SET) Breaking news update: Previous news this morning has immediately led to several sectors descending into chaos, and a steep drop in productivity of several local economies due to frightened traders locking themselves up in their docks. Fortunately, core security routines of ships were not affected by the TSS "update", so ship computers will shut down whenever a prolonged credit hack is detected. We advise all citizens to stay calm and to not let themselves overcome with fear. In these dark times, we need to stand together, otherwise the terrorists will win! Speaking of evil, we have received further news from insiders that TSS has re-organized its internal power structures and as a consequence will more aggressively pursue the destruction of faction members. All three factions have increased their security levels to red, and all of their spokesmen have declared to provide additional measures to protect their members. "Brace yourselves, wimps! Harvest is coming.." - The biggest news agencies, including GNN, and all major comm channels across the universe have been flooded by this short message signed by Harrison Straw, the elusive leader of the mysterious Shadow Syndicate. Reactions were mixed: Keldonian news anchorman Blub Fnebab commented sarcastically "probably they have developed an automatic bribing machine and a more comfortable leash to lead the Emperor around on". A Union politician called it "a hoax, like that whole TSS thing" and added "Our faction is clean." Independent security experts have nonetheless expressed concern, one of them stating "We have become too comfortable with TSS, but they still are a highly criminal organization, and they are evolving". In fact, several anonymous TSS drop-outs have leaked to GNN recent private messages indicating extensive re-organization going on in TSS's power structures. It is speculated that last month's sudden disappearance of twenty top hackers and computer experts may have a connection with this issue. The Esteemed Pilots Syndicate takes the matter seriously as well - as their spokesman proclaimed "Our information shows this is indeed something to be worried about and we fear that the factions will be awakened from their complacency soon enough." Today the secret of the so-called Neuro-Tech Innovation Drive, as it had been dubbed, was at last unveiled. At the official press conference, reporters and spectators alike listened in awe as leading scientists explained how the new Stim Chip worked, providing a safe and viable alternative to the dubious benefits of drug usage. To top it off, production of the Stim Chip fell well within legal and ethical standards for all three factions and neutral territories. While explaining the details of this proclamation, two additional press releases came out, causing an even more passionate storm of debates amongst observers universe-wide. Despite countless diplomatic struggles, conflicts, and relentless wars in the past, leaders of all factions, together with spokespeople of various intergalactic crime-fighting organizations, have come together today to announce the impending completion of a secret project begun decades ago on a remote space station by a group of independent scientists. According to the official press release, we will soon witness a set of neuro-technological innovations which "will change the economic and political laws of this universe as we know it". Commentators have already dubbed this impending universal event the "Neuro-Tech Innovation Drive", despite being completely clueless as to the details and to just what degree these bold statements will actually turn out to be true. Today a historic event has taken place in our universe: The arrival of The Aperture. Earlier today, closed wormholes in several clusters began fluctuating heavily, emitting signs of intense energy flow. In a few sectors the very fabric of space itself was torn, and new wormholes emerged out of pure energy, as if someone was trying to violently drill a hole from the other side. Quickly it became clear that one feature The Aperture brought was an expansion of the universe, paving the way to four new clusters. Doomsday scenarios were laid aside and the first convoys of explorer vessels eagerly entered the new territories via worm- and x-holes. But perhaps the explorers acted too hastily. Just a moments after the venturesome scouts entered new grounds, distress calls containing hellish, never before heard noises flooded the comm channels before abruptly terminating. The scraps of data collected indicate gruesome life forms have been amassing on the other side of the new passages, possibly drawn by emissions discharged by the unstable energy fields. Eager for only one thing – fresh blood to feed upon – the terrible creatures flooded out of the new openings and began to scatter in every direction. Passing through wormholes and xholes alike, it was not long before the remotest parts of the universe were under siege – even the Pardus core was not spared by this powerful invasion of bizarre life forms. A short time and countless panic attacks later, the situation was somewhat stabilized. All three factions expressed great concern in keeping their clusters secure, as well as in claiming new territories. The universe's most renowned hunters and fighters, of Federation, Empire, Union and neutral origin, grouped together to systematically drive back the waves of invading critters. Soon the most fearsome creatures were driven away into the neutral zones, leaving three of the four new clusters open for colonization. These new clusters have been allocated equally between the factions, and were dubbed Federation South Human cluster, Empire West Ska'ari cluster, and Union North Rashkir cluster. The fourth cluster, which housed the highest concentration of life forms, could not be cleared and has been left unclaimed. This new neutral territory has been named Split cluster, after its unique topography. We at GNN share our condolences with the fallen explorers' families. However, we are also excited with the opportunities the new clusters present to pilots everywhere, and wish all colonists and explorers good luck! One last word of advice: If you value your life, avoid entering the Split cluster, especially its dense nebula fields – so far the brave souls who have dared enter them have not been seen or heard from since. All inhabitants of the Pardus universe are speechless: What began a few days ago as small fluctuations in the energy-fields of several clusters, leading to minor annoyances for energy well operators, has increased to a full-grown and universe-wide "energy-earthquake" with major shifts and rips in the space-time continuum. Scientists can offer no explanation - probably no similar event has taken place since the big bang. And as the big bang can be traced back to a certain point in time, a new event of related proportions - which the scientific community has coined "The Aperture" - can be extrapolated to culminate at an exact date in about two weeks from now. Around the same time the fluctuations started, signs of new, unprecedented lifeforms had been reported from the universe's borders. What sounded like stories of gory horror-creatures invented to scare children had not been taken seriously at first. This negligence has allowed some of the new species to evolve and expand across the whole universe at an enormous rate, posing a threat to all space-faring lifeforms. For the moment, this threat is relatively minor, but who knows what will fall upon us next. Astro-biologists speak of "Hyper-Evolution", opening a new, fruitful branch of science for the coming centuries - if those centuries are actually going to take place. While many cults and sects already have declared the impending collapse of the Pardus universe (raking in credits from the wave of new aspirants), others are glad to be alive to witness an event never experienced before. We have no other option than to wait, hope, and see how The Aperture is going to turn out. In a public statement broadcast universe-wide, Federation officials this morning announced Admiral Cere's forced resignation and stripping of rank, following an internal investigation ordered by top levels of the Federation government. The investigation has been underway since shortly after the Usube incident, when the Federation's Defense Department received some anonymous tips regarding Former Admiral Cere, who until today has been in charge of collecting evidence and attempting to uncover the exact cause of Usube's destruction. The investigation found that Former Admiral Cere is, in fact, full brother of the infamous space-pirate Ragnar Cere - information that Former Admiral Cere has kept carefully hidden from acquaintances and colleagues. It is now believed that Ragnar is responsible for detonation of the weapons that ultimately annihilated Usube. While as of now it is not believed that Former Admiral Cere supported Ragnar's actions or assisted him in any way with the destruction of Usube, it is known that Former Admiral Cere did in fact destroy much of the data recovered after the incident took place, resulting in confusion, accusations and war. "I was only trying to protect my brother" Former Admiral Cere told GNN as he was escorted away for questioning by Federation Military Police. Ragnar Cere, who is not affiliated with any faction, is still at large. The High Commander of the Federation himself took time from his busy schedule today to speak at this morning's broadcast. "The Federation has been acting on information that to the best of our knowledge at the time was true, and I see no wrong in that," the High Commander addressed the universe. "However, in light of this new information, war is no longer necessary nor justified. The Federation is fully prepared at this time to withdraw troops and discuss our differences with the Empire peacefully." In response the High Commander's statement, the Emperor told GNN only "The Empire is ready for peace, but as always we will remain prepared for war." Peace talks are expected to begin early next week. Troops of both factions are already beginning the long journey home. This concludes this GNN special report. We at GNN wish you safe skies and growing profits during this time of peace. We at GNN are saddened to bring you news of yet another tragedy seemingly related to the Usube incident. Earlier today an explosion sent residents of the city of Elatan, Andexa, scrambling for cover. The explosion leveled Elatan's largest government building, a storage facility for sensitive information which was also being used as a headquarters for accumulating material for the upcoming Usube trial. Aside from the tragic loss of life, the Federation also lost invaluable data; much of the material regarding the Usube incident and UEWTR was so sensitive that no copies existed. With the trial looming ever closer, the Elatan bombing is truly devastating for the Federation. The Empire has refused to agree to reschedule the trial, stating the bombing was suspect and likely just an act staged to buy the Federation more time. In response Admiral Cere, spokesman for the Federal Armed Forces, addressed the universe in a speech claiming all evidence to date pointed toward the Empire. Quoting the old Earth adage, "If it looks like a Ska'ari, walks like a Ska'ari, and clacks like a Ska'ari, it probably is a Ska'ari", the Federation announced that it now considers itself in a state of war with the Empire and all who support the Empire, and that any ships not registered with the Federation were to be shot down immediately if detected inside of or approaching Federation territories. This concludes this GNN special report. We at GNN wish you a good night and continued good health during this time of war. Having officially concluded investigations of the debris collected after the Usube incident, scientists are still unable to state with certainty the exact cause of the weapon detonation that devastated the planet. However, the researchers were able to restore some fragments of footage recovered from a security camera that had been located deep inside the Federation's formerly secret Usube Experimental Weapons Testing and Research (UEWTR) base. All parties were shocked to see the camera had recorded two Ska'ari, dressed in full Imperial military uniform, moving through the heart of UEWTR. Imperial representatives were quick to defend the outraged accusations of the Federation, asserting that the trespassers were not acting under Imperial orders and that the fault lay with the Federation's insufficient security measures. In the interest of averting war as tempers rose on both sides, it has been agreed that the matter will be settled once and for all at an interplanetary trial held in the neutral zone, involving judges from both factions along with neutral independents. We at GNN will continue to keep you updated on any significant developments in this matter as the two factions scramble to prepare for the upcoming trial. The Empire and Federation have declared a truce after a nonfaction laboratory commissioned to analyze the debris left behind following Usube's annihilation found traces of an unknown and highly unstable material which may be at least partially responsible for the planet's destruction. Pending further investigation, scientists claim it’s highly unlikely it was manufactured by any known race of beings. As this has cast some doubt on the Federation's involvement in the Usube affair, the Empire has ordered a stand-down until further research is completed. Additionally, plans for terraforming Usube are now underway. While still denying any direct responsibility for the destruction of Usube, the Federation, in a gesture of goodwill, has already spent immeasurable energy, resources, time and money to begin the long process of terraforming. With the war now on hold, the Empire is able to offer much needed assistance. The first and most important steps in making this ancient homeworld habitable again are already nearing completion - restoration of the atmosphere and water. Tension between the two age-old enemies remains high, however. Both Federation and Empire officials declined to comment when asked if the ceasefire was likely to lead to lasting peace. Rumors indicate that further and more detailed investigations will have to be done in order to disclose what actually happened in Usube’s demise. It is a sad day today as reports have been confirmed that the planet Usube has been essentially destroyed. The universe mourns the loss of hundreds of thousands of souls, lives cut tragically short apparently in the name of weapons testing. Empire officials, based on preliminary evidence from scans of the remnants of Usube along with previously gathered intelligence, hold the Federation responsible for this tragedy. For decades, according to Empire intelligence reports, the Federation has been developing an array of weapons designed to eradicate life on entire planets. It would seem now that the Federation has, in fact, succeeded. With tensions already high from the recent disaster which released the Federation Z-series drones, the Empire has demanded the Federation immediately cease all manufacturing of weapons capable of such large scale mass destruction, and disassemble those weapons currently in existence. 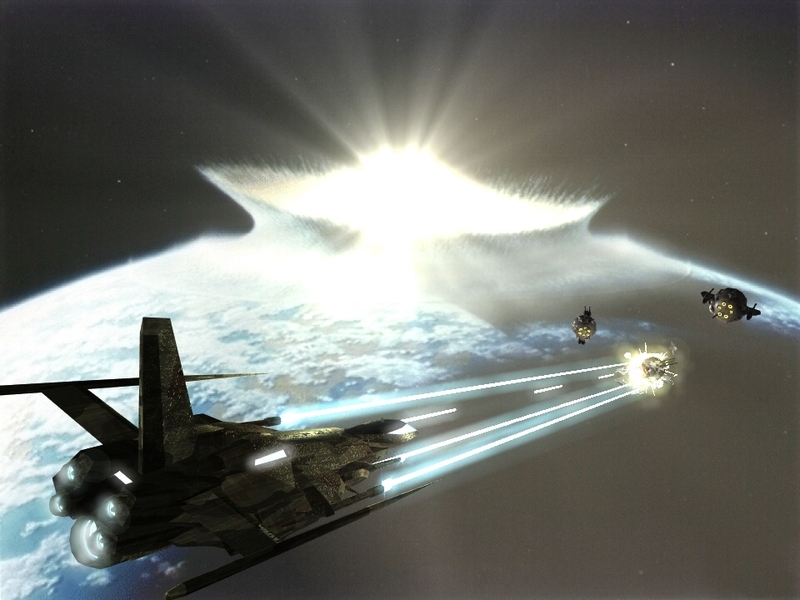 Federation officials, while acknowledging they have been exploring the potential of such weapons, deny responsibility for Usube's annihilation, claiming detonation of the weapon was a result of sabotage; and refuse to comply with the Empire's demand. This refusal has resulted in the Empire declaring war on the Federation.